Are the Dead, Really Dead - What Is Death? WHAT happens to a person when they die? Is there really a heaven and a hell? The answers to these questions may surprise you. You are about to find out that what you may believe, may not be what the Bible says about death. The Bible is very clear about the state of the dead. We must first establish the facts about the nature of man. The first Bible text we need to look at is Job 4:17. "Shall mortal man be more just than God? Shall a man be more pure than his maker?" The word mortal means subject to death; the word immortal means not subject to death. The word immortal is used only once in the Bible, 1 Timothy 1:17. "Now unto the King eternal, immortal, invisible, the only wise God, be honour and glory for ever and ever, Amen." God is the only One who has immortality. 1 Timothy 6:l6 is even more clear. "Who only hath immortality, dwelling in the light which no man can approach unto; whom no man hath seen, nor can see: to whom be honour and power everlasting. Amen." Only God has this power of immortal existence. Man is described as being mortal, or subject to death. Some people believe that the above texts refer to the body and that the soul is immortal, and that the soul itself cannot die. This next text will forever clear up this misunderstanding. "Behold, all souls are mine; as the soul of the father, so also the soul of the son is mine: the soul that sinneth, it shall die." Ezekiel 18:4. This text says that the soul is subject to death. Nowhere in the Bible is the doctrine taught that the soul is immortal. If the soul is subject to death, then where did this belief originate that the soul does not die? We can start at the beginning of the Bible and find out very soon who is responsible for this lie. You can read Genesis 3:1-4 which is the conversation between the Serpent and Eve and you will see in the fourth verse that Satan, the Serpent, told Eve the very first lie: "Ye shall not surely die." Right at the beginning of mankind, Satan originated this lie that the soul would not die and it has been carried down through the ages. If indeed the soul is mortal or subject to death, then what actually happens when a person dies? "Then shall the dust return to the earth as it was: and the spirit shall return unto God who gave it." Ecclesiastes 12:7. This scripture states that the spirit shall return unto God who gave it. What does it mean when it speaks of the spirit? In Job 27:3 it says, "All the while my breath is in me, and the spirit of God is in my nostrils." This text shows us that the spirit which God gives to man, is in his nostrils. Genesis 2:7 says, "And the Lord God formed man of the dust of the ground, and breathed into his nostrils the breath of life; and man became a living soul." God breathed into man's nostrils at creation and that breath of life is the spirit which returns to God at death. So the words breath and spirit are used as the same word in the Bible, meaning the life which God gave man. And the breath and or spirit is how man lives. The body of mankind was formed out of the dust of the ground and then God breathed life into man and he became a living soul. You'll notice that man became a living soul, not received a living soul. There is a difference. These two things make up life breath from God and dust from the ground. Read Psalms 104:29,30. "Thou hidest thy face, they are troubled: thou takest away their breath, they die, and return to their dust. Thou sendest forth thy spirit, they are created: and thou renewest the face of the earth." Life and death are here described together and the words breath and spirit are used the same. If the fact then is that the body returns to the ground and the breath of life returns to God, then where are the dead? When Peter in Acts 2:34 was speaking about David the patriarch, he answered the question. "For David is not ascended into the heavens: but he saith himself, The Lord said unto my Lord, Sit thou on my right hand." Acts 2:29, "Men and brethren, let me freely speak unto you of the patriarch David, that he is both dead and buried, and his sepulchre is with us unto this day." Peter made it perfectly clear that David was still in his tomb, not in heaven or hell as many believe. David will come forth when the "dead in Christ rise first" at the second coming of Jesus. David is now resting in the grave until the resurrection. This answers the question about the ones who die with faith in Jesus, but what happens to the wicked when they die? Do they go to a place called hell? Are they punished at the time of their death? 2 Peter 2:9. "The Lord knoweth how to deliver the godly out of temptations, and to reserve the unjust unto the day of judgment to be punished." The wicked are reserved until the day of judgment, and then at that time they will receive their punishment. Where are they until that time? John 5:28,29 answers the question, which is Jesus speaking: "Marvel not at this: for the hour is coming, in the which all that are in the graves shall hear his voice, And shall come forth; they that have done good, unto the resurrection of life; and they that have done evil, unto the resurrection of damnation." Where are they? They are in their graves. If you just stop for a moment and think about this wonderful truth. You will realize that our loved ones who have preceded us in death, are not being tormented now in hell, nor are they in heaven either where they would be looking down upon the terrible scenes taking place on this earth. They are all sleeping the sleep of death until resurrection morning. The Bible calls death a sleep. Jesus said his friend Lazarus was asleep when he referred to Lazarus' death. "Our friend Lazarus sleepeth" John 11:11. Then in John 11:14 Jesus said, "Lazarus is dead." Christ called Lazarus forth from his tomb where he had been dead for four days. When Lazarus stepped forth from his tomb, he did not say that he had been to heaven. If Lazarus had been in heaven, don't you think that he would have protested about being brought back to this sinful earth. He would not have wanted to stay here for even one minute. He would have told those around him of the glorious scenes of heaven. But Lazarus did not speak of heaven. Lazarus had been sleeping in the dust of the earth since the breath of life had left him. Ecclesiastes 9:5. "For the living know that they shall die: but the dead know not anything, neither have they any more a reward; for the memory of them is forgotten." Lazarus was not conscious of anything that was going on during the time he was in the tomb. Psalms 146:4 says; "His breath goeth forth, he returneth to his earth; in that very day his thoughts perish." We have no thoughts after death. Psalms 115:17 tells us that there is no praise of God as far as the dead are concerned. "The dead praise not the Lord, neither any that go down into silence." Isaiah 38:18,19 says: "For the grave cannot praise thee, death cannot celebrate thee: they that go down into the pit cannot hope for thy truth. The living, the living, he shall praise thee, as I do this day: the father to the children shall make known thy truth." Psalms 6:5 says, "For in death there is no remembrance of thee: in the grave who shall give thee thanks?" Why Face A Future Judgment? Why would there be a judgment set for the future, after the second coming of Christ, if people were already in heaven or hell? 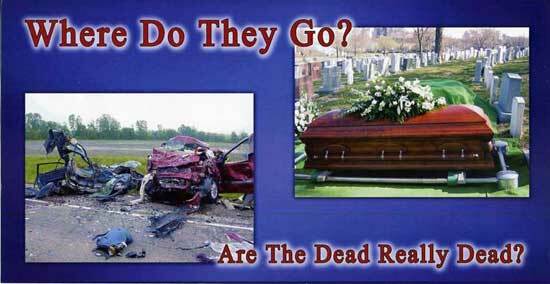 The false belief that the dead are still alive is confusing. How can one that is dead be alive at the same time. Why would he have to face a judgment in the future if he had already received his reward or punishment at the time of death. The Bible is not confusing us. The Bible states only the truth. The Bible facts are: "And, behold, I come quickly; and my reward is with me, to give every man according as his work shall be." Revelation 22:12. "For the Lord himself shall descend from heaven with a shout, with the voice of the archangel, and with the trump of God: and the dead in Christ shall rise first." 1 Thessalonians 4:16. "We shall not all sleep, but we shall all be changed. . . in the twinkling of an eye. . . for the trumpet shall sound, and the dead shall be raised incorruptible. . . for this corruptible must put on incorruption, and this mortal must put on immortality." 1 Corinthians 15:51-54. When we die, it is as sleep to us. Whether we have died years ago or just a few days before the second coming of Jesus, it will seem to be but a moment of time until we are resurrected. Just as you go to sleep at night and without realizing the time that has gone by, it is morning. So it will be when we fall asleep in death. Resurrection morning will seem to come to us in a moment of time. Let us pray that we will be counted among the loyal and faithful in the resurrection of the righteous. That when we fall asleep in death, our hearts will have already made the decision to serve the Lord and our names will be written in the Lamb's Book of Life. The truth will set us free. Free to know what the Bible says about death. Free to know the whole truth of God's Word. Praise God! For a more in-depth study on this subject, go to the chapter entitled: The First Great Deception from the book, The Great Controversy.